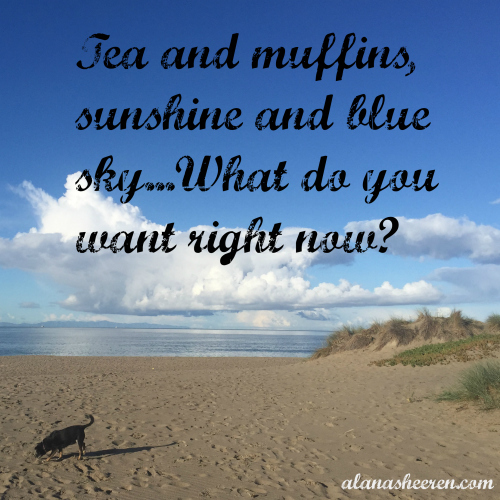 I’ve said it before and I’ll likely say it again – knowing what you want is vital to your well being. What you want to do, who you want to be, what you want to have. What do you want to do in this moment? And in the next? And the next? You might not be able to act on it – you might not want to act on it – your therapist might have told you specifically not to act on it – but it’s still important to know. This morning I wanted to sleep in until 6:15am, so I did. I wanted to sit for a moment with my tea and eat a rich, delicious grain-free muffin with dark chocolate bits that a friend gave me yesterday, so I did. I wanted to eat another muffin, but I didn’t. Sometimes wants change. Sometimes I have to reframe my to-do list to a want-to list. Sometimes I don’t get what I want. But checking in with myself and asking the question in the little moments add up to me being the woman I want to be and having the life I want to have. Baby steps eventually become the big picture. What do you want, right now, today? What baby step can you take toward giving it to yourself?